I hadn't ever heard of this book before a couple of weeks ago, I picked it up at my local library in the "What's New in YA" section and judged it solely on its cover art and title. I'm so glad that I decided to randomly pick it up and that Phillips' publisher chose such a compelling cover for it. I'll be honest, I have a soft spot for poetry and am a poet at heart. I think the fact that this entire young adult novel is written in verse caused me to be a little biased in giving it the full five star rating. I'll say right from the start that if you don't enjoy reading poetry and stories in verse then this book is not for you. Laura leads a seemingly normal teenage existence, minor drama with boys and best friends, babysitting, school, etc. However, Laura's life is remarkably different because of her mother and the fact that no one will communicate with her about what is wrong. Obviously psychology and mental illness were much more hush hush subjects in the 1960's, a lot of new therapies were just being utilized because of the previous generation's research and discoveries. People still didn't appreciate or understand what mental illness; the fact that it can be just as debilitating as any physical ailment. I believe that many people today still don't appreciate or understand this point. 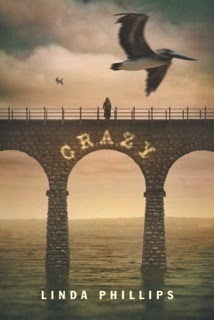 Crazy is so honest and beautifully written, my heart was both broken and filled with joy by the entire experience of reading it. The subject matter would lead one to believe that this book would be quite depressing, but it was actually very uplifting. It advocated for hope in strong friendships, medical advancements, and simply communicating honestly about mental illness instead of making it a taboo topic. Laura begins to notice ways in which she and her mother are similar, including their affinity for art. When no one talks to Laura about her mother's condition she struggles with the fear that she might also turn out the same way because of these similarities. Anyone who has family members or friends who suffer from mental illness also begin to self-assess, even if they know exactly what is going on with that person, because it is only natural to regard mental illness as something very scary and unknown. It's not as easy to scientifically understand as physical illnesses, there isn't one sure way to catch mental illness or combat it either. I found Phillips' writing to be spot on, on her Goodreads author profile she states that she has been influenced by Mary Oliver and J.D. Salinger, I definitely recognized those influences in her writing and enjoyed them. I look forward to seeing what else she publishes in the future. I chose cherry phosphate as the drink to either go with this novel, or at lease represent it. I found an interesting website about cherry phosphate that includes a recipe if you're interested in making it at home, since it obviously isn't readily available at any soda fountain like it was in the 60's. This book, like cherry phosphate, is a rare find in the market today. As I said earlier, I think that mental illness is still widely misunderstood, especially when it comes to teenagers... who are all crazy honestly. I think more needs to be written about mental illness that specifically reaches out to the young adult audience because maybe they will learn more about themselves and others around them. Not that long ago homosexuality was considered a form of mental illness, that is ludicrous to most of us today, so maybe if each generation continues to better understand what mental illness is and relate to it differently - not see it as simply something dark, unknown, and scary - then the future will be a better place to live and be understood.